Once we had crossed the Prince George Lock we entered yet another Shoreham industrial area; there seem to be quite a few of them! However, there were no interesting looking structures of heavy industry here; there were just steel clad boxes. We had a brief respite at Kingston Beach where the Kingston Buci Lighthouse sits in a small oasis, although even this is next to a busy road. Lorries ferry to and from the industrial units. Industry, it seems, is never that far away in Shoreham. 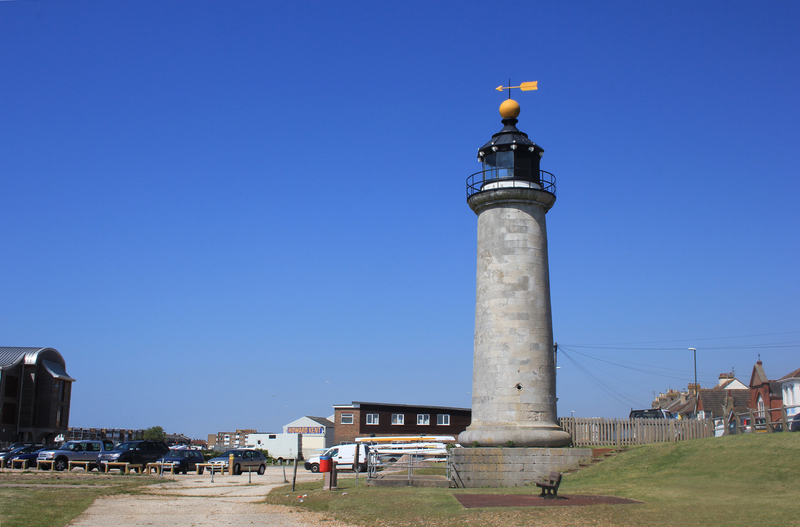 The lighthouse keeps watch over the harbour area and is sat on the north bank of the River Adur. We had to continue along this bank until we could reach a crossing point and so get back to the coast. On we went, straight back into light industry, lining the unpleasant and dusty road. Every now and again we tried to divert to the river bank itself, but barbed wire or palisade fencing barred our way. We had no option but to continue along the road. We also noticed we were getting hungry, and needed to stop, but there were no cafes. No petrol stations which might sell sandwiches. Not even a burger van which you would normally expect to see on an industrial estate. Just then, to my horror, the only available answer to our hunger pains suddenly presented itself. Dusty roads and McDonald’s lunches were not what we were supposed to be experiencing. Quite the opposite in fact. 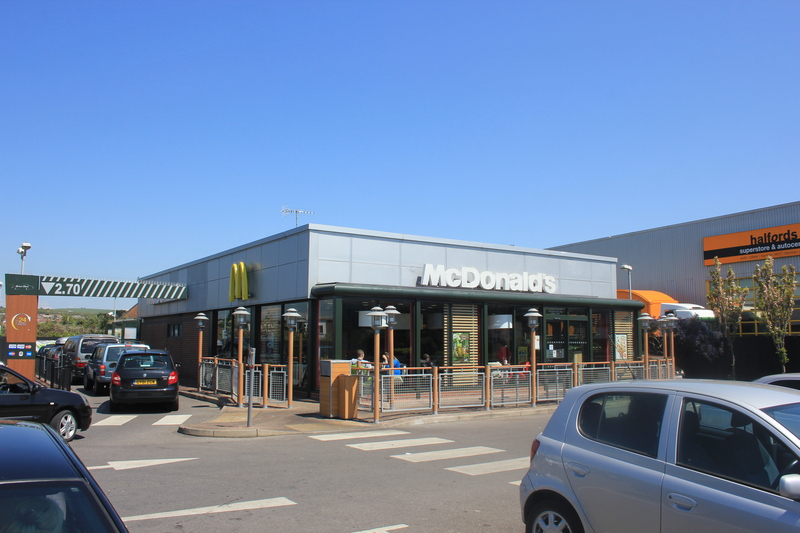 I did not walk 400-odd miles to end up at a McDonald’s and nor did my wife (I won’t bring the kids into this because they seemed quite happy with the situation; in fact they seemed very pleased indeed). With a deep breath, we entered and ordered lunch. The day, I decided as I searched my map for the next available crossing point, was beginning to take a rather tedious turn. 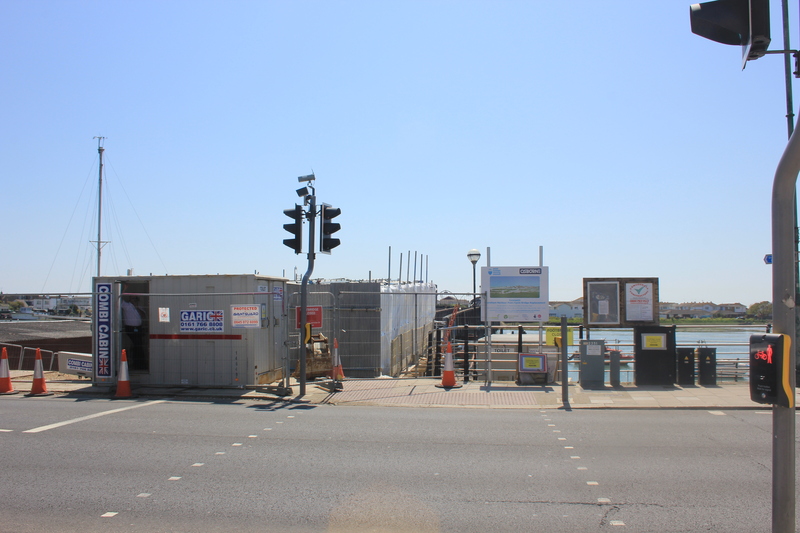 This entry was posted in West Sussex and tagged coast, footbridge, industry, McDonald's, shoreham, travel, walking, west sussex. Bookmark the permalink. Oh no! Disaster! I don’t know which is worse, the bridge having gone or having to eat at McDonald’s. Well actually the bridge having been closed down was a blessing in disguise. We had to go further upstream to corss, and because of that saw some of the most incredible houseboats I have ever seen. Photos to follow in my next post. We would have missed them if the footbridge had been open. A tag for McDonald’s? Do they merit it? !